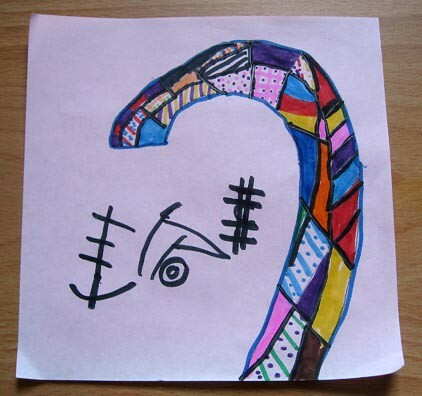 You are currently browsing the category archive for the ‘Art Lessons for kids’ category. 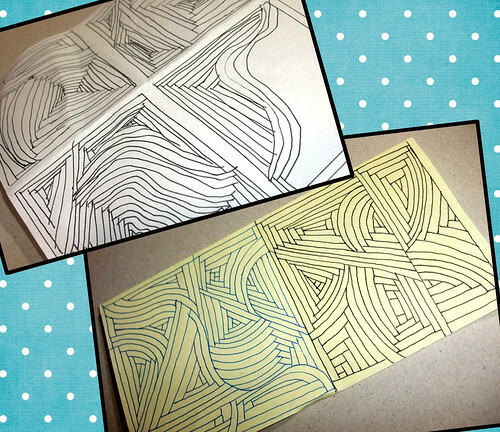 Jaylene (white paper below) and I (yellow paper) have been making endless doodles, inspired by this lesson. We find a square and fill it up. Some of them we jazz up with color, most we just doodle and move on. What’s been mesmerizing you lately? We recently read the book The Life and Work of Wassily Kandinsky by Paul Flux. Kandinsky (1866-1844) was a Russian artist who travelled around Russia, France and Germany. 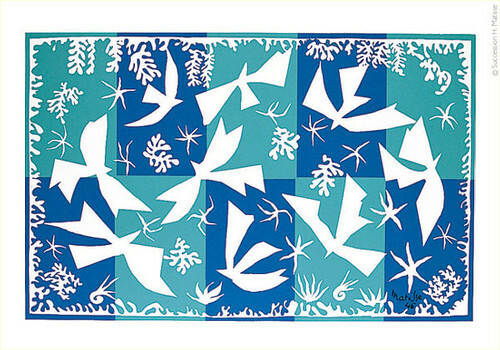 He is famous for filling his paintings with colors and shapes. We particularly enjoyed his Composition VIII. 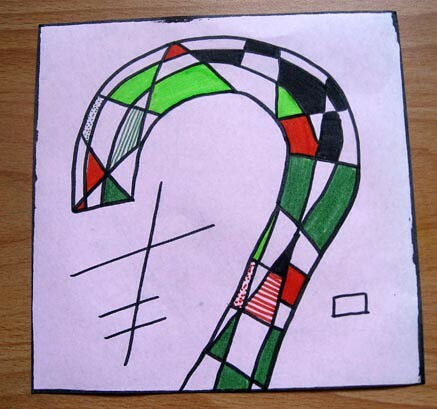 We thought it would be perfect inspiration for some Kandinsky Candy Cane drawings. 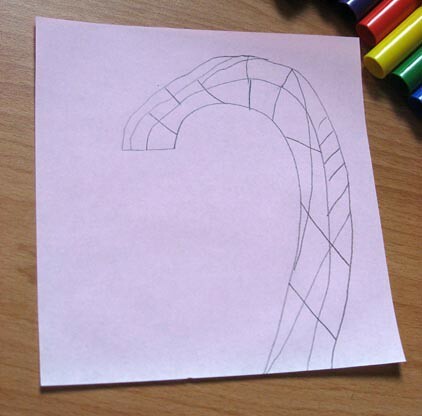 First, draw a rough outline of a candy cane. If you need to adjust it, don’t worry about the extra lines. In fact, add more lines so that you’re left with a grid that’s full of different shapes. Make sure the shapes aren’t too small. Fill in the shapes, alternating colors. It’s wise to limit your color selection to three or four. Add patterns and color some completely black. Play around with it until you’re satisfied with the results. 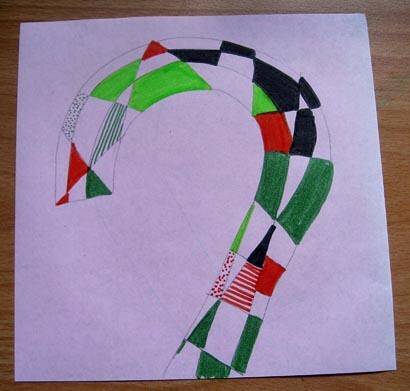 Use black or another dark color to outline the shapes and candy cane. Add some criss cross lines and random shapes. 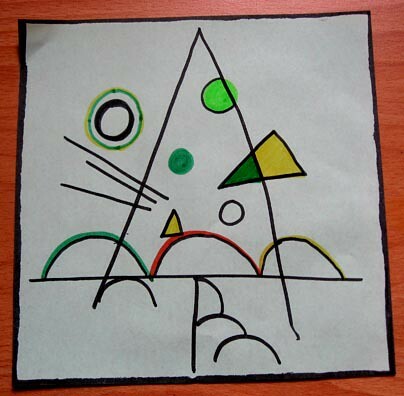 We were also inspired to make Kandinsky Christmas trees. 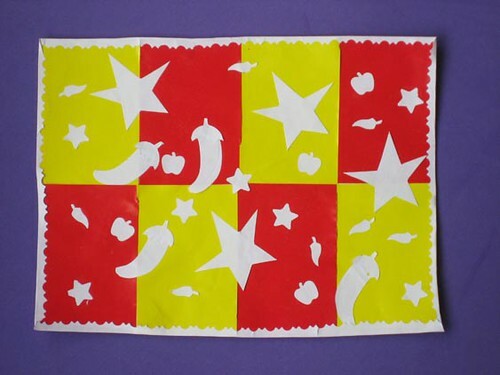 We read The Life and Work of Henri Matisse by Paul Flux and and thought some of the Matisse paintings would be a good inspiration for our Unplug Your Kids’ challenge of fruit. First we picked out a painting we particularly liked. To make your own, you need two pieces of brightly colored origami paper (15x15cm) and some white paper. Cut the origami paper into blocks that are 5×7.5cm, and alternating colors, adhere them to the white paper. 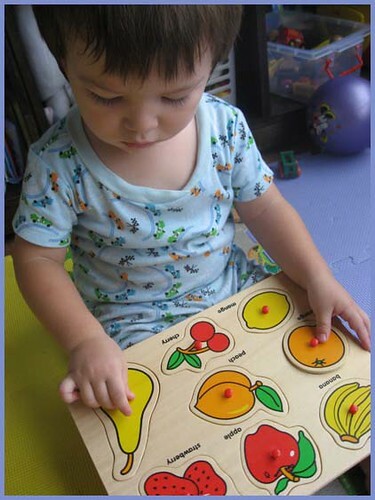 Then cut out or use paper punches for your chosen shapes, making sure there are large ones and small ones. Move them around until you come up with a design you like and then stick them down. Use specialty scissors (or just tear the edges) on the white paper, creating a frame that you’ll fold back over the design and glue down. Hang your artwork for all to admire. We also drew inspiration from a series of faces painted on bright backgrounds. And this is what Jaylene came up with. They look like simple drawings, but it took her many tries to come up with the final result. It was a good lesson on how artists often paint, repaint and repaint many times to produce a painting that looks effortless. After all that, we needed a healthy snack to revive us, so we cut up some fruit for a fruit salad. When I was a kid, fruit salads meant apples, oranges and bananas. 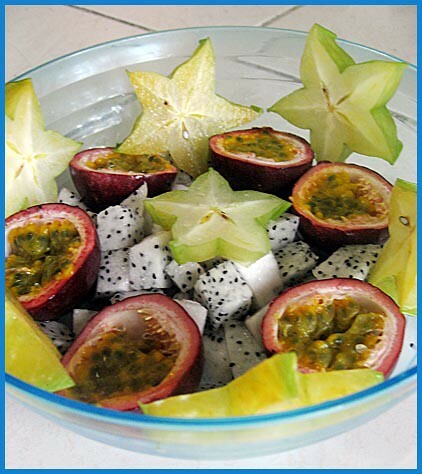 Today we had dragonfruit (bright pink peel with white inside), passionfruit (dark purple shell with yellow inside), custardfruit (puffy green with white inside) and starfruit (yellow through and through). We didn’t end up using the custard fruit. I’m not even sure what the proper English term is for that one is. 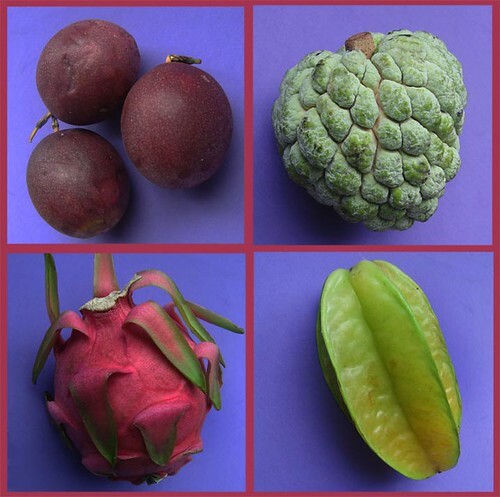 I think making up names for fruit is something we do often as we call wax apples, water apples. They’re much more watery than waxy, but I digress. And what was Jayden working on while we were having such fun times? Puzzles and napping, but he helped us eat the salad, but only the white fruit of course. That’s all he eats these days, white stuff. What’s your favorite fruit?